Recycled plastics are increasingly being used to produce new fibers in the textile industry. Chairs roll back and forth, tabletops are raised and lowered and acoustic panels can be installed as freestanding elements: The protagonists at Orgatec 2016 are mobile and flexible. Whether covered with fabric, made of plastic or wood, office furniture is becoming ever more colorful and increasingly boasts an unusual design with a view to lending offices a lively atmosphere. Colorful office landscapes for the gray cells. But inner qualities also count: A marked trend towards a sustainable handling of resources is evident especially in manufacturing and processing. For example, in the textiles sector recycled plastic is increasingly used to make new fibers, while floor coverings are made from production waste or entirely of natural fibers without chemicals. For 20 years, British textile manufacturer Camira has been a pioneer in the sustainable and environmentally sound production of fabrics. Traditionally, the range remains free of patterns, and follows a clear line. The fabrics are generally multicolored and the palette focuses on subdued and flecked fabrics from Bordeaux red to cobalt blue. 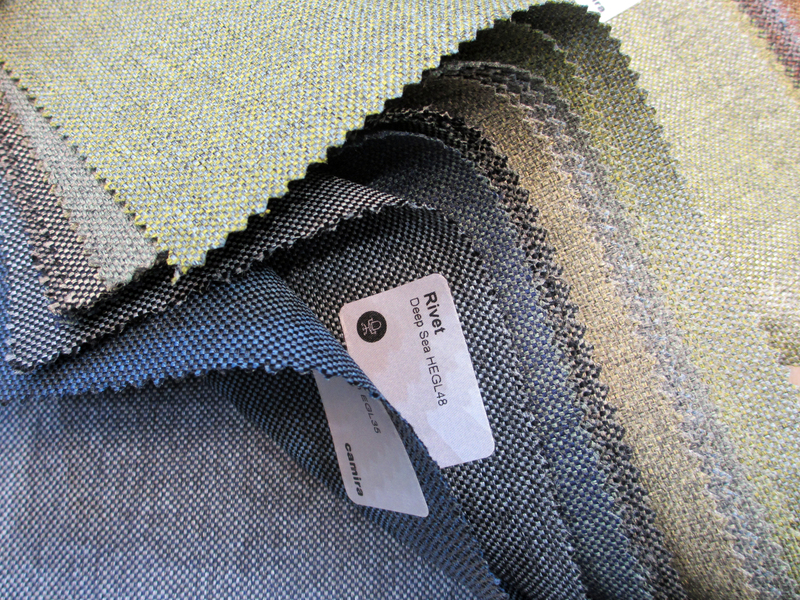 The first signs of the firm’s wish to focus on environmentally friendly manufacturing methods were evident back in 1996 in the use of fewer chemicals, recycled materials and natural fibers, with the product lines “popular fabrics,” “x-treme” and “Lucia” numbering among the first recycled fabrics at Camira. For the yarns of its fabrics the company processes both natural fibers such as linen, wool and hemp and waste from its own production process, cutting scraps and recycled plastic bottles, so-called post-consumer products. At Orgatec the firm presented the new fabric “Rivet” made entirely of plastic: One meter of fabric is made from two dozen bottles. 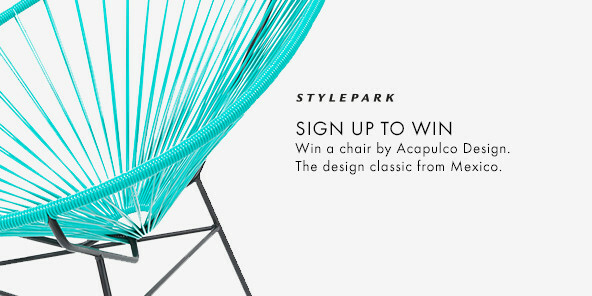 The 22-member design team always examines all production areas for their sustainability, as Camira is concerned with preserving traditions and continuity and not with trendy greenwashing, as Catherine Counsell, Design & Development Manager of Camira, emphasizes in her interview with Stylepark. That is also revealed in the product range: With just a few yarns, many different-colored fabrics can be made that find use in all areas of life. 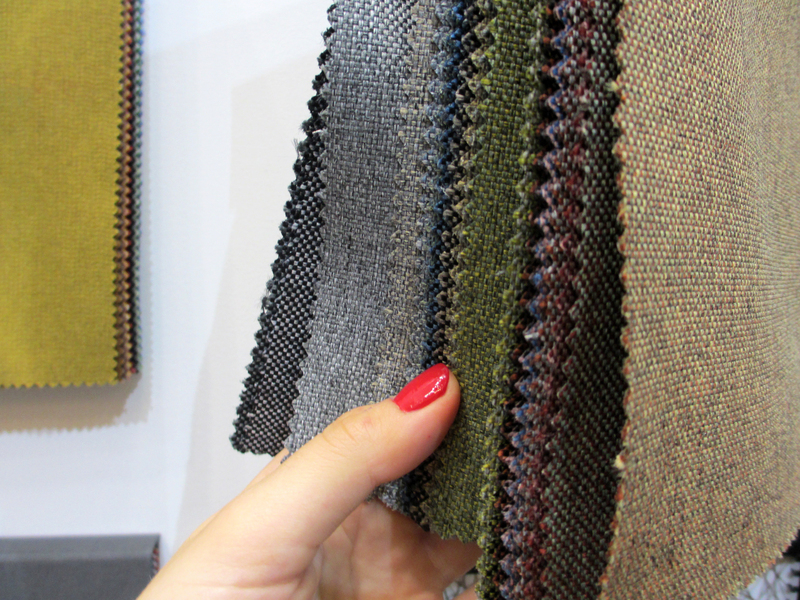 Two dozen bottles make one meter of fabric: Camira presented the new fabric “Rivet” at Orgatec, made entirely of recycled plastic. While subdued tones dominate with the Brits at their exhibition stand, things look more colorful at the other booths. 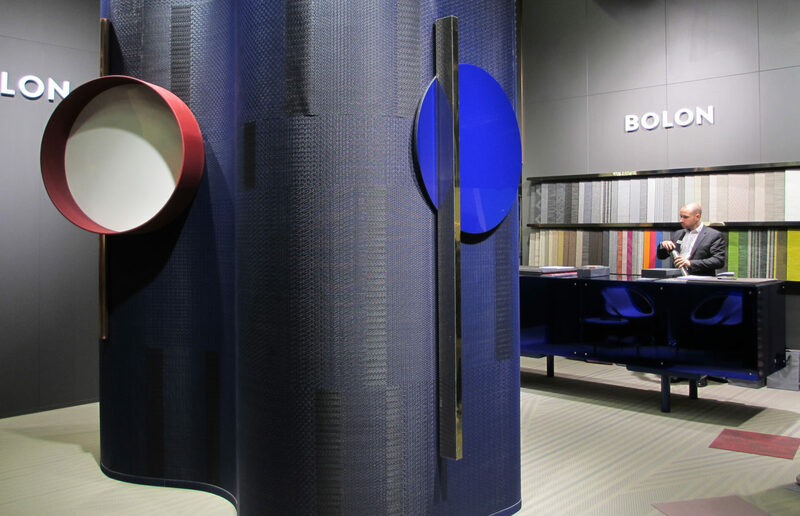 The floor coverings by Swedish manufacturer Bolon and German firm Object Carpet boast diverse patterns and huge variation. At Bolon all production steps take place in the factory in Sweden and the waste products from fabric production are recycled on site in the firm’s own plant. The two-layer flooring is made from equal parts of recycled and new fibers. 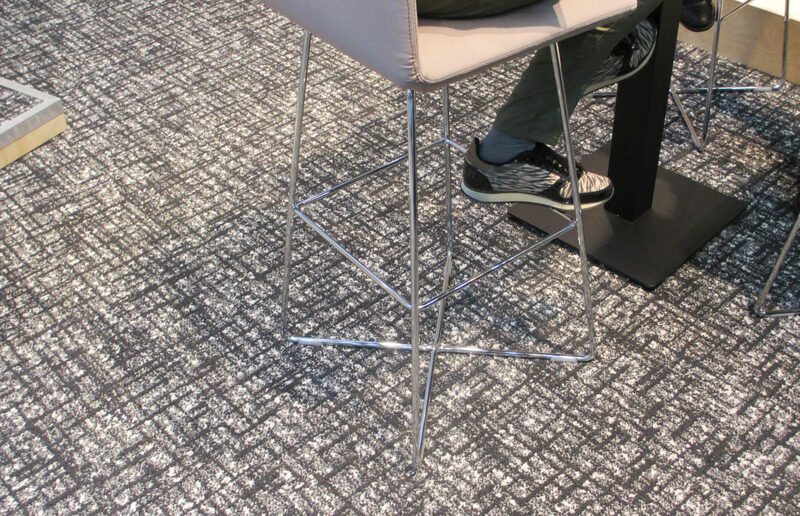 Object Carpet also goes to great lengths to take an environmentally friendly approach at all levels of production and to create carpets that in the office too are conducive not only to a pleasant ambience, but also to a healthful environment. Yet it is not just in production that the company strives to be sustainable, but with its products too, for longevity and minimal wear even with low maintenance are also important aspects of a product’s lifecycle. The industry acknowledges this and has honored Object Carpet with numerous awards. Among others, the carpet manufacturer has received the “AIT Innovation Award” and “BAU Trend Award for Energy and Resource Efficiency.” Yet not every quality seal truly says something about how sustainable a company is and neither is it the case that every percentage share of plastic in a fabric is particularly ecologically valuable and meaningful. It has long been the case that the trend has become established in corporate marketing strategies and now calls on manufacturers to actually turn the abstract concept of a good advertising slogan into a profitable fabric and a compelling corporate philosophy. The range of colors used by Swedish manufacturer Bolon stretches from gray to blue to grass green. 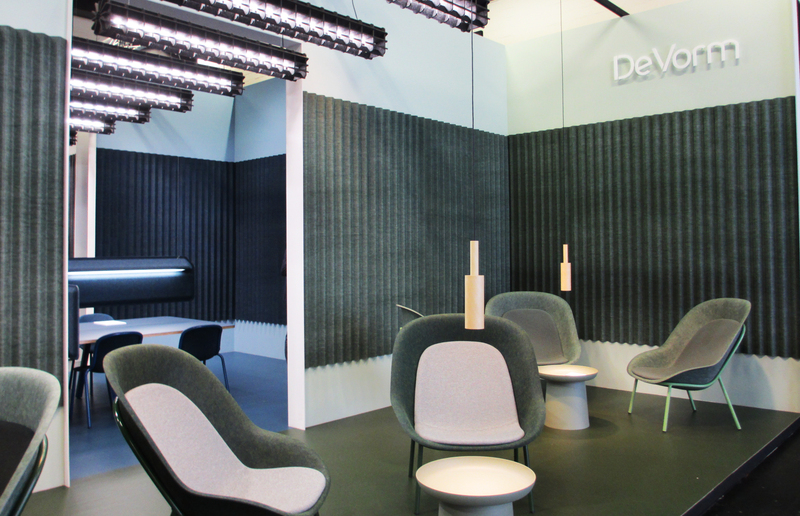 Pressed plastic for luminaires, office furniture and acoustic panels – DeVorm’s presentation at Orgatec 2016 is minimalist, in keeping with the times. With dainty patterns and still sustainable: Carpets by Interface. 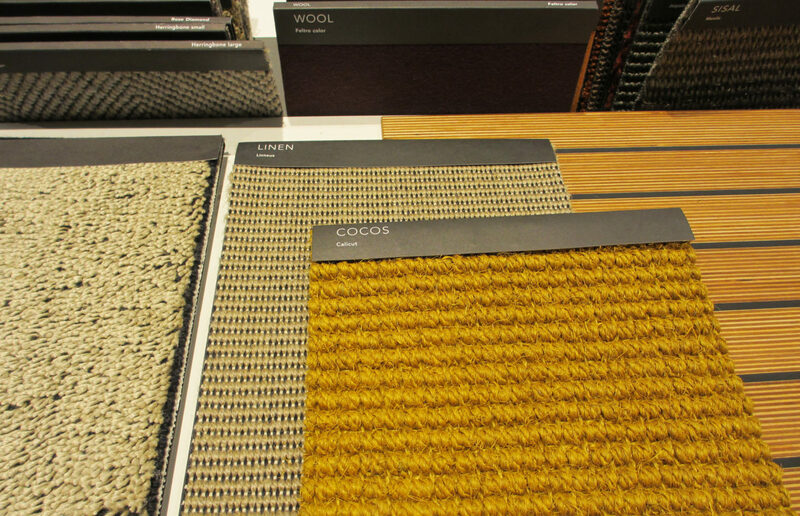 Wool, linen, sisal and coconut: Swiss manufacturer Ruckstuhl exclusively uses natural fibers for its carpets. 100-percent wood! 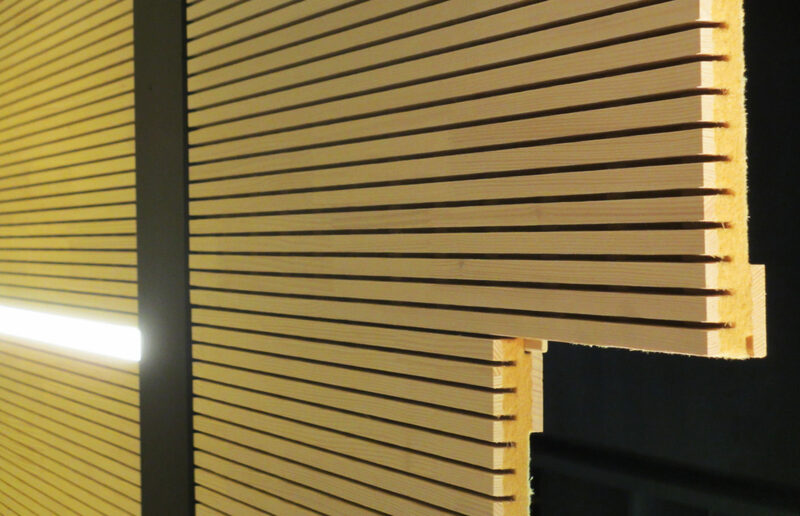 : Both the elements and the insulation of Ligno’s acoustic panels are made of wood. Moreover, adhesives are chemical-free.